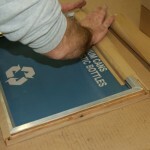 Custom Silk Screened Messaging on Recycling Receptacles vs. Stick On Decals - Glaro Inc. While in the past, silk screening was often limited to use on fabrics and paper, the technology and processes behind silk screening have improved significantly. Silk screening can be used on almost any surface, including metal waste receptaclesand recycling receptacles. 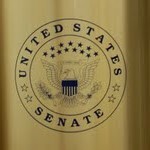 Custom Silk Screened Receptacles for The U.S. Senate by Glaro Inc.
Why should I make sure I buy recycling receptacles from Glaro with silk screened messages rather than models with stick on decals from other manufacturers? 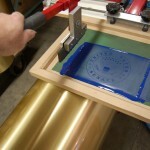 In our experience, silk screening is the best method for a professional permanent message on your waste/recycling receptacles. Glaro technicians ink on the message or image of your choice using special UV protected inks and bake it on at a high temperature so it is able to last indoors or out. We advise avoiding products from other companies that use cheap, amateurish decals. Decals can lead to several problems, including the edges curling up and then after time falling off causing an unsightly and embarrassing situation. Decal edges also tend to get a dark edge after routine cleaning. These issues can not happen with Glaro’s unique silk screening process. All Glaro RecyclePro recycling receptacles are permanently silk-screened with your choice of standard Glaro messages for each opening. Custom silk-screened messages and logos are available upon request. Your customers will be proud to display the fine silk screened waste receptacles from Glaro Inc. that you have supplied to them, and they will come back to you every time.